The ultimate, comprehensive guide to country-by-country statistics around the world. 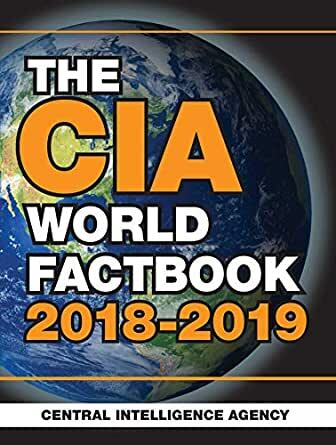 From Afghanistan to Zimbabwe, The CIA World Factbook 2018-2019 offers complete and up-to-date information on the world's nations. This comprehensive guide is packed with data on the politics, populations, military expenditures, and economics of 2018. Also included are appendixes with useful abbreviations, international environmental agreements, international organizations and groups, weight and measure conversions, and more. Originally intended for use by government officials, this is a must-have resource for students, travelers, journalists, and business people with a desire to know more about their world. The Central Intelligence Agency is an independent agency responsible for providing national security intelligence to senior US policymakers. The CIA is separated into four basic components: the National Clandestine Service, the Directorate of Intelligence, the Directorate of Science & Technology, and the Directorate of Support. They carry out “the intelligence cycle,” the process of collecting, analyzing, and disseminating intelligence information to top US governmental officials. They are located in Langley, Virginia. 1.0 out of 5 starsMissing Countries! Previous editions of the World Factbook have been known for poor editing but this edition takes the cake. By my count there are 11 countries missing from the book including Japan, Moldova, Nauru, Northern Marianas, Paraguay, St. Barthelemy, St. Pierre & Miquelon, San Marino, South Georgia, Tokelau, and Uganda. It is also missing the entry for the World. All were in the previous edition. This is completely unacceptable. The publishers should provide a corrected version. 2.0 out of 5 starsA whole country has been left out. An entire country section UGANDA is omitted from the book I received, making me wonder what other omissions occurred in this volume. The previous year 2017 edition does contain the country. Countries missing - like Japan - unacceptable. The accumulation of data is useful for the most part, but poor editing left too many careless errors in text and runs of data.